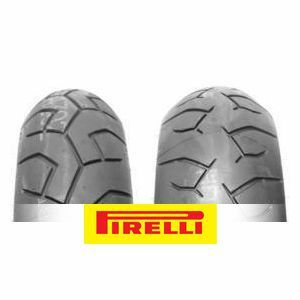 With its Diablo 120/70 ZR17 58W (Front), Pirelli offers a high-performance motorcycle road tyre designed for supersports. The profile has been optimised to deliver good traction and reliable grip in corners and especially on wet pavement. Control is improved and stability assured at high speeds. The warm-up time is reduced thanks to the new silicone compound used. An excellent all round tyre tour/sports riding it will cover all bases with ease and they seem have a profile that will suit all bikes. To review the Pirelli Diablo, you first have to log-in by clicking here.